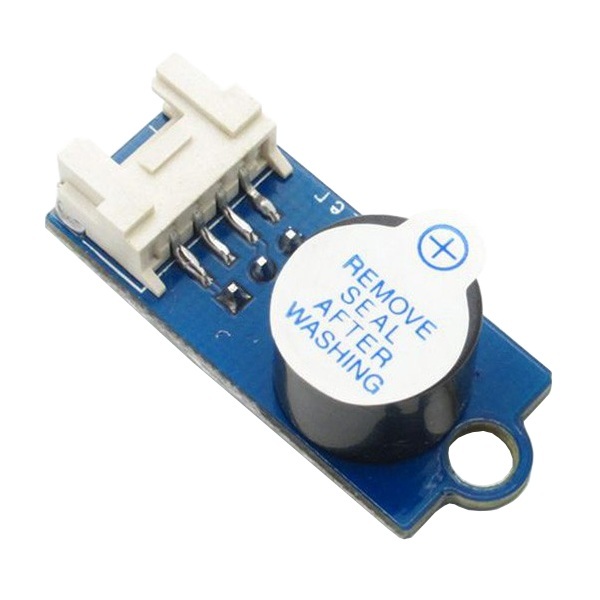 The Sound Output (Buzzer) Module features a piezo buzzer that can be produce tones and other effects by simply toggling a digital output or connecting to a PWM pin on your microcontroller. Creating a sound using the Arduino is as simple as using its "tone" command. This module has a standard 3 pin Signal/Voltage/Ground male header on the bottom and 4 pin "Grove" connector on top. An M4 hole is provided for easy mounting. Connect the Voltage (V) and Ground (G) pins to a 5V power supply and any digital output or PWM from your robot's controller to the input Signal (S) pin. When the input Signal (S) pin is high the buzzer is on and when it is low the buzzer is off. Toggle the buzzer at various rates to produces a variety of sound effects.